At High Mass, MarkDwyer, Organist and Chorimaster of the Church of the Advent, conducts Jean LANGLAIS' Messe Solennelle. 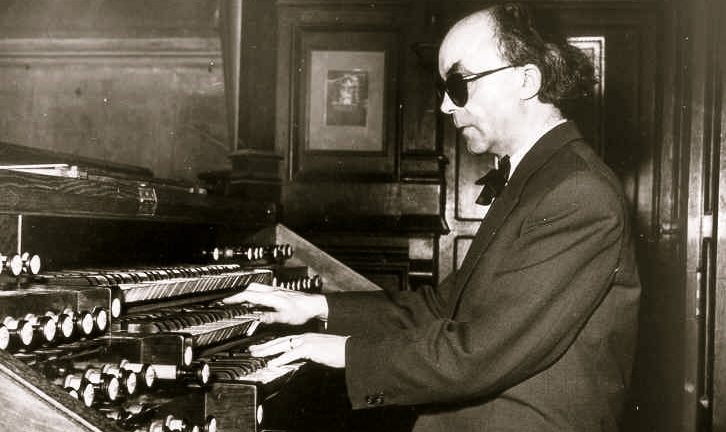 Stephen Tharp gives an organ recital in memory of his mentor and friend Jean Guillou, with works by Widor, Tournemire, Dupré, Guillou of course, a program introduced by Jean LANGLAIS' "les Rameaux" (Poèmes Evangéliques). The programme "Friendship through Music" features composers from European countries, as Monteverdi, Victoria, Cornish, Lobo, Part. The central work will be Jean LANGLAIS "Messe Solennelle". Janet Cowell conducts the "Cecilia Consort". Vocal music composed between the two wars (1919-1939) with works by Steiberg, Messiaen, Martin, Barber, Poulenc, Thalban-Ball, Harris, Bainton, and by Jean LANGLAIS, two motets "O Salutaris hostia" and "Tantum ergo" (Five Motets). Jean LANGLAIS' "Messe Solennelle" will be performed on March 21, 2019, for the 70th anniversary of its composition by Jean Langlais, along with other LANGLAIS works ("Ave mundi Gloria", "Ave Maria" and "Cantilène" (Suite brève). Other composers played: Duruflé, Alain, Fauré and Messiaen, by The Schola Cantorum of the London Oratory School, under direction of Charles Cole, with Ben Bloor, organ. The "Benenden Chapel Choir" (GB) performs vocal works by Allegri, Howells, Mozart, Bednall, and, by Jean LANGLAIS, the "Missa in Simplicitate" (Kyrie-Gloria-Credo-Sanctus-Benedictus-Agnus Dei). Symphonic and Vocal Concert at the protestant Church des Batignolles in Paris (France), with works by Saint-Saëns, Franck (Les Eolides and les Variations symphoniques), Fauré (Ballade for piano and orchestra, piano Alexandre Lacombe) and Jean LANGLAIS "La Voix du Vent" (1934) for SATB choir, soprano solo and orchestra (soprano solo: Juliana Sula). The "Benenden Chapel Choir" (GB) conducted by Edward Whiting sings works by Mozart, Allegri, Howells, Bednall,and, by Jean LANGLAIS, the "Missa in simplicitate" (Kyrie-Gloria-Credo-Sanctus-Agnus Dei). Orchestral and Vocal concert given by "Paris Rive gauche" orchestra, Vocal Ensemble Leonor, FiatCantus, direction Marielle Cafafa, in works by Fauré (soprano Carole Cantin), Franck (Les Eolides and Variations symphoniques for piano and orchestra with Sandra Petit, piano), Fauré (La Ballade for piano and orchestra with Alexandre Lacombe, piano), and, by Jean LANGLAIS, "La Voix du Vent", composed in 1934, for orchestra, choeur SATB, soprano solo orchestra (soprano Juliana Sula).